1989: Elaine Colhoun, seated second from left, presents a cheque on behalf of second year pupils at Clondermot High School to Mrs Lesley McAuley, NSPCC. Also seated are Avril Watt, teacher, and James Fielding. 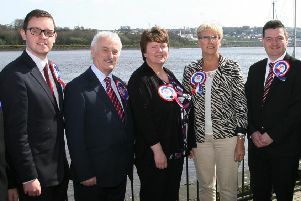 At back are James Connor, Robert Finlay, Carol Walker, Lesley Cowan, Gary Duddy, Anne Henderson and Keith Heaney. We’ve delved into the Derry Journal archive to take a walk down memory lane. All the way back to 1989 and 1992! Recognise anyone? 1989: David Page, Collon Lane, Derry, who was winner, for the second year in a row, of the Galliagh Festival Best Kept Garden competition, pictured with his wife, Betty, and daughter, Nicola, in his prize-winning garden. 1989: Isobel Duffy (on right) hands over a cheque for �200, the proceeds of a charity quiz held in the Derby Bar, to Foyle Action Cancer secretary Serena Villa. Included are the captains of the finalists, Pauline Harley (Wellsworths) and Paula Heaney (Altered State). 1992: Patrick Sweeney with his dog which won Best of Breed in the Elkhound section at the Derry Dog Show. 1992: 'Chitty Chitty Bang Bang' passes under Magazine Gate during a tour of the city centre. 1992: Fans of 'Chitty Chitty Bang Bang' brave the rain to see the magical car make its way down Shipquay Street during its visit to Derry. 1992: Derry City striker Jonathan Speak outjumps St Patrick's Athletic defender Morris O'Driscoll during the sides' league clash at Harold's Cross, Dublin. The Dubliners won the tie by two goals to one. 1992: Pupils from Foyleview School, Derry, who won medals at the Special Swimming Olympics. At front, from left, are Catriona McLaughlin, Bridie Cleere, Cathal Bell and Janice Whoriskey. At back are Stephen White, Martina Bradley, Mark Gleeson Patrick Cassidy, Michael McGowan and John Murphy. 1992: Pictured enjoying the St Peter's High School-St Cecilia's Secondary School 5th Year Social are, seated, Roisin McCann, Tara Moran, Grainne McGuinness, Melanie Harkin and Nicola O'Kane. At back are Peter McLaughlin, Gavin Curran, Darren Burke, Kevin Bowstead and Kevin McFeely.